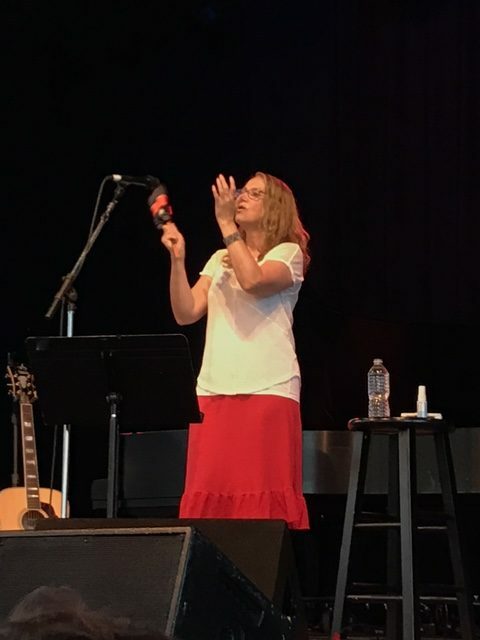 Twenty years ago, Joan Osborne and Shawn Colvin were main-stage acts on North America’s first female-only music festival, founded by Sarah McLachlan. The resulting “Lilith Fair” was successful enough in Summer ’97 to warrant an encore in Summer ‘98, again featuring Osborne and Colvin. 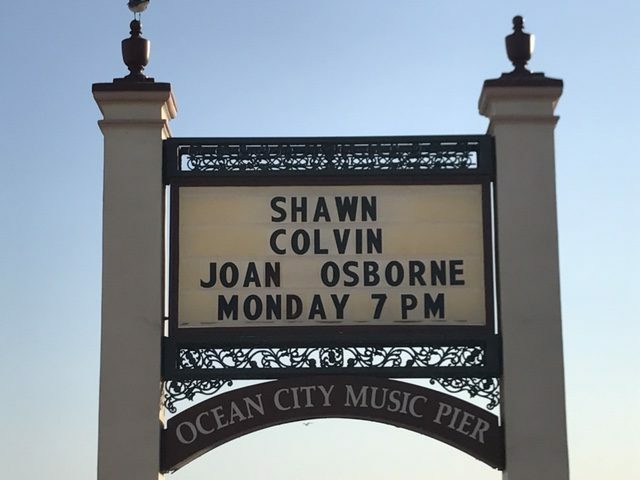 With their recent show at the Music Pier still fresh, it’s too early to guess if they’ll be back in Ocean City next summer. But if so, much of this week’s crowd would welcome their return. Joan Osborne is best remembered for her Grammy-winning, 1996 Top 5 Billboard pop hit, “One of Us”. What may be less known is that she’s one of the better song interpreters currently working. This reviewer had some idea, having witnessed her perform “Little Red Corvette” with Philadelphia’s The Roots at Brooklyn Academy of Music in December 1999, plus watched her reverent take on “What Becomes of the Broken-Hearted” with The Funk Brothers, in 2002’s acclaimed Standing in the Shadows of Motown film documentary. What this OCNJ Daily critic and Bob Dylan fanatic didn’t realize, was that Osborne has a new album of Dylan covers coming out in September. So, to call Osborne’s set, comprised entirely of Dylan songs aside from her trademark hit, a pleasant surprise might be underselling it a bit. Equally unprepared, were Andrea & Herb Brunhoffer, a Philadelphia couple visiting Ocean City, seated nearby in row two. 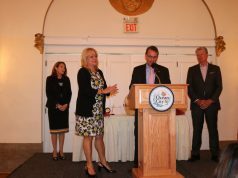 Andrea has been visiting Ocean City for 49 years. 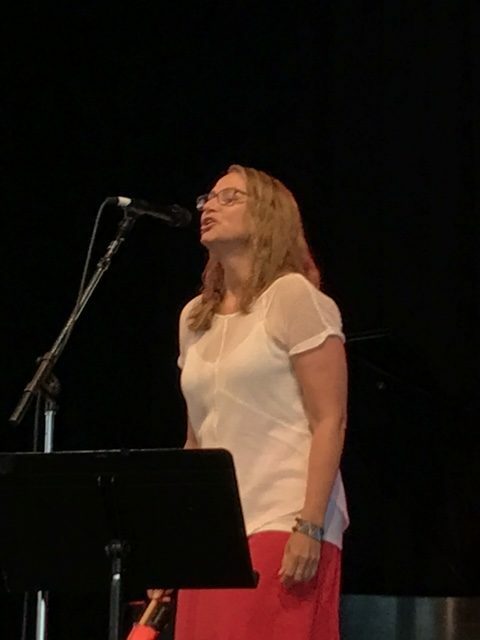 She was at the Music Pier last summer for Colin Hay, another one of her favorites, but calls Bob Dylan “my number one, easily”. When Osborne introduced the night’s program, before launching into “High Water”, from 2001’s Love & Theft, delighted smiles over our luck were exchanged. Osborne has shown another side of Dylan before, covering “The Man in the Long Black Coat” on her 1995 debut. If this performance was any indicator, this recent self-described “deep dive”, will unearth more treasures. Osborne’s set was an eclectic, hand-picked mix from Dylan’s extensive catalog. It featured deep cuts (“Spanish Harlem Incident”), protest anthems (“Masters of War”) and big hits (“Rainy Day Women”). “Women”, the highest charting number of Dylan’s career, was rendered nearly unrecognizable. Between session ace Jack Petruzelli’s electric guitar riffing and Osborne’s blues wail, “everybody must get stoned” gained sexier undertones. This rendition gaining steady play on Philly’s WXPN 88.5, who hosted the evening, would not be surprising. Joan excelled with some inspired assistance, both in the form of Dylan’s songbook and her company onstage. 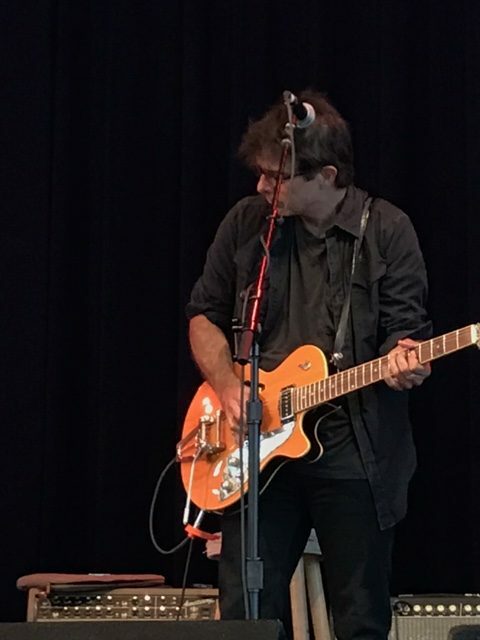 Petruzelli, a New Jersey native and member of “The Fab Faux”, provided bittersweet acoustic six-string underpinning to make “Buckets of Rain” shine. He also moved to piano late in the show, so Osborne could “Ring Them Bells” for everyone scuffling through “this very intense time”. 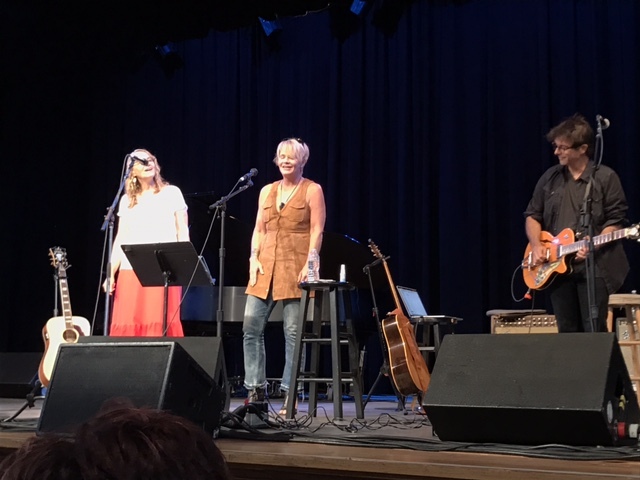 On the encore, Osborne brought out Shawn Colvin, for the first time on this tour. 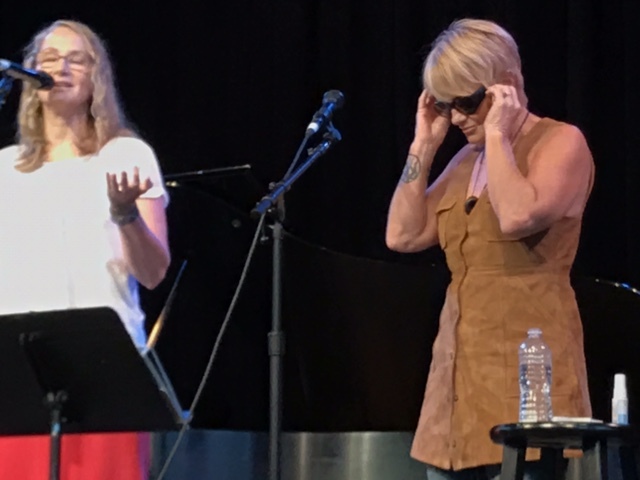 “When’s the last time we’ve sang together?” Osborne asked her, once Colvin belatedly made her way out onstage and the sound synced. “I have no idea”, mumbled Colvin, “the nineties?!?”. Osborne, having plenty of recent practice, clearly had full command of the lyrics to the Dylan classic “Tangled up in Blue”. In addition to singing her verses, Osborne helpfully cued up Colvin’s on her iPad. It was a sweet bit of impromptu teamwork, giving their sets a baton-passing feel. 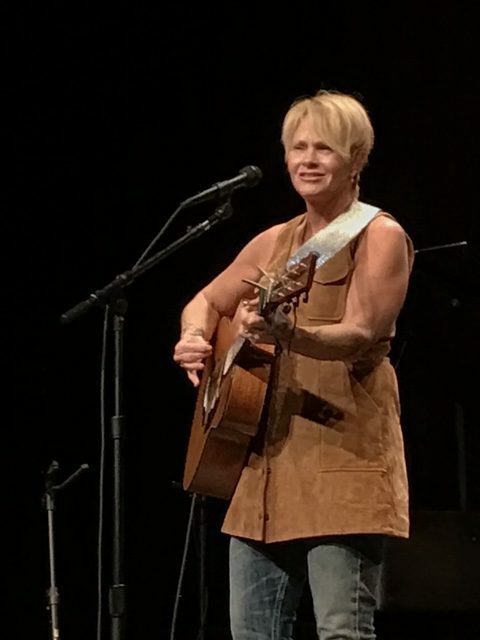 The headliner, Shawn Colvin, is more commonly known for her songwriting. She’s respected enough by peers, like Steve Earle and Richard Thompson, to instruct at Earle’s Camp Copperhead songwriting retreat. 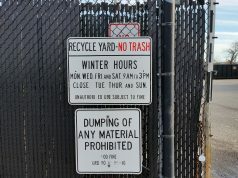 Colvin, a South Dakotan armed with a charmingly self-deprecating, salty sense of humor, claims she doesn’t have much insight on the writing process. “I don’t know what to tell these campers”, then stated “thievery, sleep and deadlines” were the three keys over her thirty-year career. 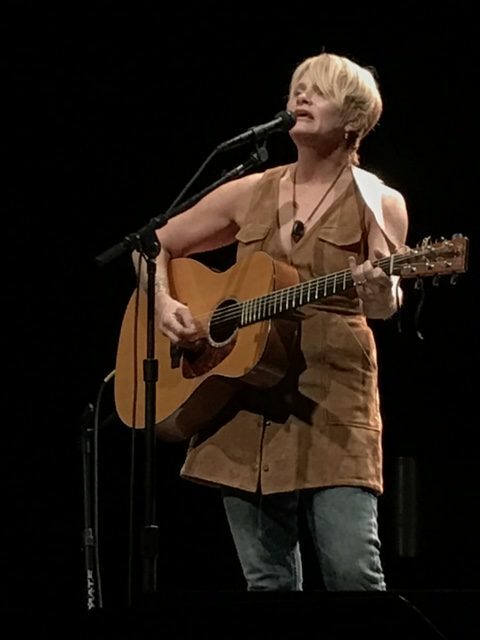 Following a headliner in her own right, who just performed a set of songs penned by the 2016 Nobel Prize Winner for Literature, is a tall order. 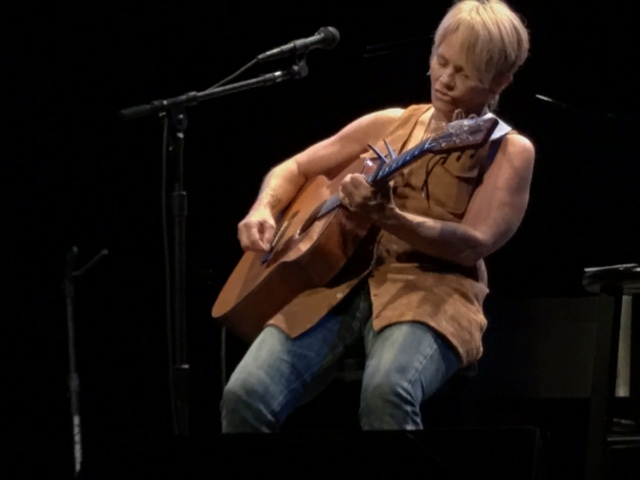 Undaunted, Shawn Colvin was able to rise to that challenge. She did so by piggybacking on the momentum Osborne’s set built, while highlighting their differences as well. 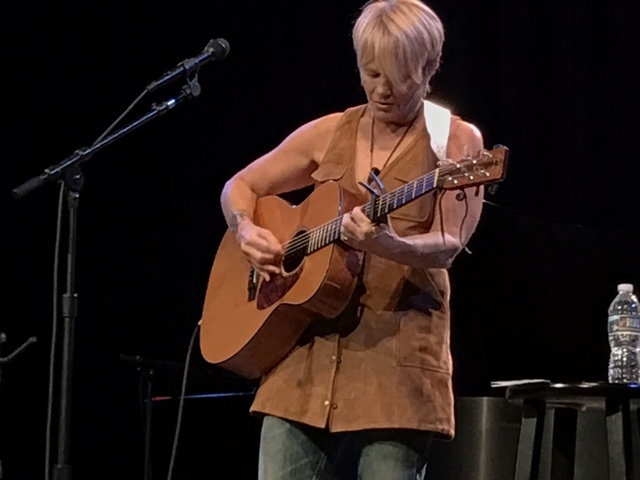 Colvin, who performed solo, utilizes “alternate” guitar tuning, a la Joni Mitchell. This occasionally led to her having to re-tune between songs on Monday night. Luckily, if Colvin ever craps out as a concert draw, or a guitar tech, she’s got a possible future as a comedian. While playing with nobs and testing strings, her riffs on touring life, aging and ill-advised romance, struck a chord. When they weren’t clapping or listening intently, Colvin had the crowd laughing with her. This isn’t to say Colvin didn’t also mine the songwriting Hall of Fame archives. Her encore included takes on “Ol’ 55” by Tom Waits and Talking Heads’ “Naïve Melody (This Must Be The Place)”. She was bold enough to break out Bruce Springsteen’s “Tougher Than the Rest” mid-show. “I know, it’s pretty nervy to try to do a Boss song, while playing in Jersey”. The crowd, appreciating the acknowledgement, let her know she pulled it off. Colvin primarily stuck with her own creations, selections from her “long catalog of breakup songs”. One of those was 1997 Song of the Year Grammy Award Winner, “Sunny Came Home”. “Sunny’ has been described by Steve Earle as “the ultimate break-up song”. Colvin once asked Earle, no stranger to breakups himself, why he thought so. His reply was simple: “because it’s a murder ballad”. Fair enough. An appropriate bit of Gallows’ humor there. 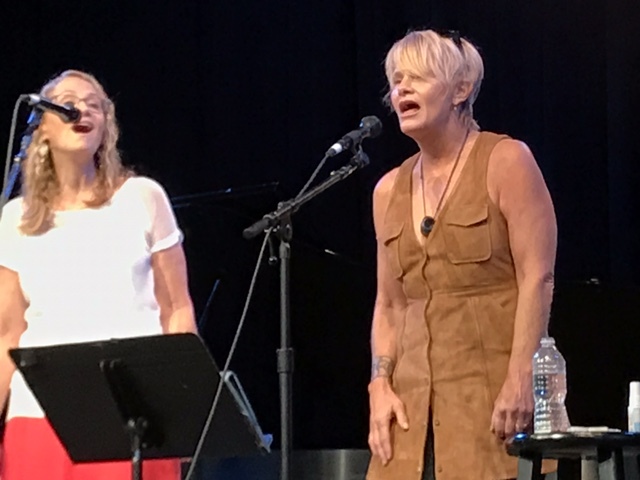 20 years after Lilith Fair, it’s nice to have Joan Osborne and Shawn Colvin still out there, walking on the wire.